Raphine Volunteer Fire Company Inc. 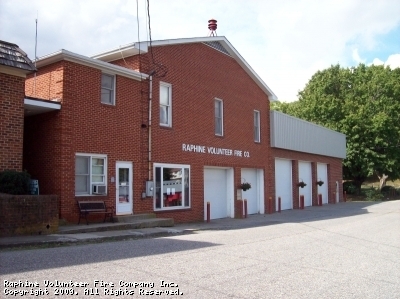 The Raphine Volunteer Fire Company, Inc. is located in Rockbridge County, VA. We are just off exit 205 of Interstate 81 near the Augusta County line. We serve a primary area of about 88 square miles and a primary population of about 9000 people. Our department is built with 100% volunteers and we operate out of one station. We provide Fire Protection and Basic Emergency Medical Services to the counties of Rockbridge and Augusta. We also serve the community as being a emergency shelter. Our response area is mainly rural and residential with commericial area located near the Interstate. We primarily serve the towns of Raphine, Vesuvius, Steeles Tavern, Spottswood, Greenville, Lofton, Newport, and Brownsburg. We assist neighboring fire companies South River, Middlebrook, Walkers Creek, Riverheads, Rockbridge Baths, Stuarts Draft, Montebello and many others when we are needed. We will be cooking chicken on Rt 11. Chicken should be ready around 11am. Come out and support your local Fire Dept and get some delicious chicken! BBQ Chicken Dinner At the firehouse! The flower bed in front of the bank was failing due to many issues and it was decided to tear it down before it caused any major problems. We will be replacing it and the sidewalk in the near future and it will be ready to go before the parade. This site has been viewed 218,690 times.